How To Be A Better Gamer: What makes a game better than the rest? I really enjoyed my first trip with Alan Wake in Bright Falls. I had heard a lot of buzz leading up to the games release, and was completely engaged in the television style storytelling and Stephen King-esque narrative when I finally got my hands on it. To me it was greater than the sum of it's parts. I was sincerely invested in who Alan Wake was, and the strangely humorous yet fascinating world he was discovering with me in the passenger seat. Playing Alan Wake recalled feelings of when I first played Grand Theft Auto III, Bioshock, and Half Life 2. Discovering the world and characters of those games was as much fun as playing the game itself, and it's what I remember the most. 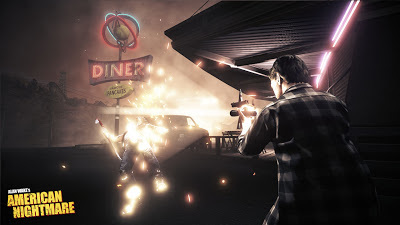 When Alan Wake's American Nightmare was announced, I wasn't interested in what new weapons or enemies were added, or game modes, or anything game play specific, really. I just heard the name Alan Wake and was eager to once again journey with him in his world. Unfortunately that eagerness was overshadowed by other aspects of my life, gaming and non gaming related. Also I have a self imposed rule to not buy games at full price; especially digital downloads. This rule helps me keep my impulse video game purchases at bay, and allows me to play my large backlog, while I wait for a drop in price of games on my wish list. When it went on sale and after I finally got around to recently playing it, I figured the distance between when I played the original would hinder my ability to quickly jump back into that world. But, much like any good memory that lasts, it didn't. Alan Wake was back, and it was like he never left. I realize that Alan Wake's American Nightmare isn't as revered as the games I mentioned above, or a lot of the major games that were released in 2012 for that matter. Critics seemed to either dismiss it for not being as lengthy or compelling as the original, or give it more thought beyond an average review score. 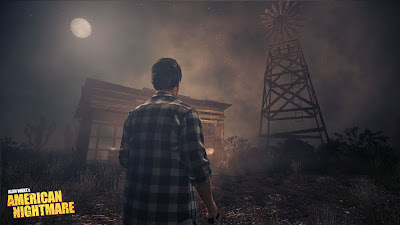 I think the reason Alan Wake isn't a super mega blockbuster franchise is because it really is one of those games that you have to play it to see if you like it. I can't blindly recommend it like a Portal or Red Dead Redemption or Batman: Arkham City. Those are games that target specific genres at the same time crossing the bridge into many others. They have a lot of universal elements that can make a lot of people happy they are playing them. Franchises like Grand Theft Auto, Mario, etc. all have something for everyone and are easy to recommend and sing the praises of night in and night out from one video game blog to the next. But not Alan Wake. When I talk about how much I love it, and in hopes that it grows into a large franchise, I always say it with a disclaimer, "But that's how I feel, you might not enjoy it as much." The hope is that the person will. But why do I feel the need to add a disclaimer to a game I feel passionately about? is it because it hasn't receive similar praises elsewhere? Am I afraid that they will Google the top ten games of 2012 and maybe only see Alan Wake's name once, compared to the overflowing nominations of Walking Dead or X-Com or Mass Effect 3. But can't my disclaimer be said for all games? Let's examine the game of the year discussions: Walking Dead, Journey, X-Com, etc, etc. It's an endless repetition of this game is great because it has this many stars or 9's out of 10's and this best of year list matters because it's another one person's opinion. Or decided on by a committee whose declaration is born from not because it was enjoyed the most by everyone but for meeting a very specific criteria relative only to the people involved, or the website/blog/organization they represent. Does that take away the merit of any of these games? No, and it shouldn't. But I think what it does take away from, is why we play games. Why we get excited for games. Why we want other people to play games. Why we want games to be considered it's own and not be held in the same category of art/entertainment as movies, t.v., and literature. I feel it also takes away from what makes a game unique. We shouldn't sit around and talk about why Journey should be game of the year over Walking Dead and vice versa. We shouldn't try and put a 1 next to X-Com and 2 next to Black Ops. We can't take what makes one game special and expect it to compete over another game's individuality. We celebrate the New Year because of what we have accomplished in the past, and what we look forward to accomplishing in the future. We should celebrate the games we enjoy the most, and not try to compare them against other's. We shouldn't weigh our lists against others and establish points to games that get voted the most and create a whole due process as to why a game needs to be heralded as Game of The Year. We should try to encourage other's to play the games we love, so that they can share in our experience, not to promote the best of the best. What happens to a game that "wins" a game of the year, or makes a best of the year list? When I look at those lists, I either recognize games I've played or didn't play. Does it make me view those games differently? No. If you call Walking Dead game of the year, do I look back on my experience with it and does that change it? No. I can't change how I felt. We also can't change how someone will react. If I tell someone to play Walking Dead, and they tell me they didn't like it, by me adding, "But it won game of the year!" won't make them say, "Oh, really? Well, in that case, I did like it." In the end we are going to enjoy what we like. I think people try to use game of the year lists to publicize games that may be their favorite or games they think everyone should be playing, but it doesn't change any one's perception when they actually pick up and play the game. It's an exhausting, end of the year battle of emotions that in the end is pointless. Until we are able to convey why a game is worth playing without star rankings or letter grades or it's number on a list, only then will we able to convince someone to play something we enjoy. We will have made it personal to ourselves, and hopefully that connects with the other person on their own level that gets them to pick up the controller and play. When I turn on a game like American Nightmare, I'm not thinking "Game of the Year" or "Is this better than Walking Dead?" or "Would I rather play this or Resident Evil 4?" I'm thinking about the story of Alan Wake. The craziness of Mr. Scratch. The puzzling yet compelling narrative. The colorful yet flawed archetypes that make Night Springs charming and unique. I'm thinking about an experience that I can't find in other games, because Night Springs doesn't exist anywhere else, except in the first Alan Wake. I'm thinking about what makes it unique, and how that doesn't make it better than the rest. I'm thinking how much fun I'm having and how do I express it the next time someone asks "Have you ever played Alan Wake's American Nightmare? Is it good? Should I play it?" I think it's good. But you shouldn't play it unless you've played the first one.